Designed with a larger-mesh top box and a smaller-mesh rocking sifter, the double decker allows you to sift through two mesh sizes simultaneously. The upper box is clamped into place on top of the bottom sifting screen. After the material remaining in the top box is processed, the top box is easily unclipped and removed, leaving the sorted smaller matrix in the bottom rocking sifter--thus aiding in the identification of small objects. Our standard size sifters have 42" legs with four position adjustable height. The pivot point is located on the far end of the box. Center pivot legs are also available. 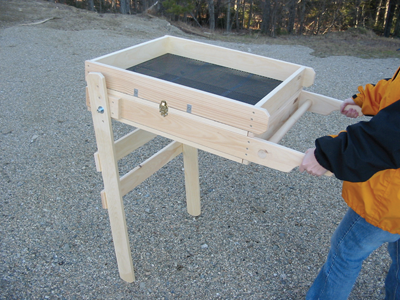 The screens are durable, yet surprisingly light and easy to carry.